The Cretzel, the Cronut, and Now Introducing the Crumpwich? You’ve heard of the cronut and the cretzel. What about the crumpwich? Not to be confused with the single, open-faced English griddle cake, a crumpwich is a sandwich made of two toasty crumpets stuffed with everything from jerk chicken to turkey and avocado. It is the brainchild of Justin Sledge, executive chef of Capitol Hill’s Queen Bee Cafe, which recently opened a second location on Queen Anne. The genius of the crumpwich is how the locally sourced, house-made sauces and accoutrements get lodged into the crumpet’s nooks and crannies. On the honey-baked, ham-and-egg crumpwich ($10.95, with salad, fruit or chips), it’s the gooey Gruyère cheese and kicky dijonnaise; on the jerk chicken ($11.95), it’s the sweet pepper chutney and Pickapeppa slaw. Sledge (who has cooked at Cafe Juanita and Salish Lodge & Spa) starts yeast duty at 1 a.m. to meet the morning rush for that breakfast crumpwich and also crafts a variety of sweet crumpets, with flavors like double-cream-whipped butter and preserves ($6.50) and lemon curd with toasted coconut ($8.25). Even sweeter: Queen Bee is owned by Aegis Living, a senior living community, which donates all of the café’s proceeds to local charities. Breakfast/brunch and lunch only. You’ve heard of the cronut and the cretzel. What about the crumpwich? Not to be confused with the single, open-faced English griddle cake, a crumpwich is a sandwich made of two toasty crumpets stuffed with everything from jerk chicken to turkey and avocado. 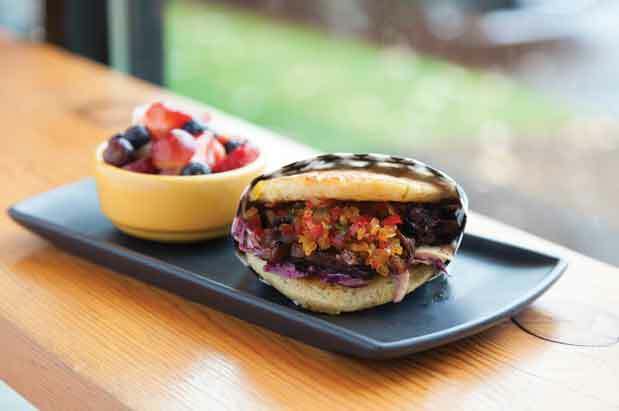 It is the brainchild of Justin Sledge, executive chef of Capitol Hill’s Queen Bee Cafe, which recently opened a second location on Queen Anne.